This may be one of the easiest reviews to write in the history of easy reviews, as the TC BonaFide presents itself as a small metal box with a single LED to show that it is powered up (via its Boss-compatible 9V input — there’s no battery option), an input jack, an output jack and... well that’s it — there’s nothing else! So I hesitate to call the BonaFide a pedal, but its format makes it about the same size as TC’s Mini PolyTune. 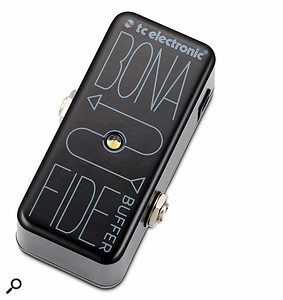 Despite apparently qualifying for least interesting (non-)pedal of the year, the BonaFide could still turn out to be an essential addition to your pedalboard, both live and for recording. It acts as a low-noise, impedance-matching buffer which can be placed at the start of your collection of pedals, the idea being that it will save you from the evils of treble loss caused by long cables, pedals that leave circuitry hanging on the signal path when the pedal is bypassed, and all those interconnects necessary to link your pedals. Providing an input impedance of 1MΩ and an output impedance of around 100Ω, there are few pedals that wouldn’t be happy following the BonaFide, with the possible exception of some antique germanium fuzz boxes that can be rather picky about what’s fed into them. My own pedalboard has been a source of frustration, the amount of treble loss leading me to put a treble booster at the end of the chain (far from the ideal way to solve the problem). Patching in the BonaFide made a significant difference to the high end and, with all my pedals bypassed, it gave me the same sound I usually get when plugging directly into the amp using a fairly short cable. The guitar also feels more lively when connected to the BonaFide — all that unwanted capacitance otherwise drags it down and loads the pickups. And that’s pretty much the end of the story! The BonaFide provides the necessary low-impedance output to drive all those pedals without succumbing to treble loss, and it means you can afford to be a little more casual about using long cables to link your pedalboard to your amp. It had no detrimental effect on the guitar’s tone or feel, and my treble booster can now join its other redundant friends in the cupboard of eternal darkness: thanks to TC, my pedalboard problem is finally sorted!